Since 1832 when Henry Newton and William Winsor introduced the first moist water colours to the world, much of our reputation for supreme quality has stemmed from the Professional Water Colour range. Since then Professional Water Colour continues to be formulated and manufactured according to our founding principles; to create an unparalleled water colour range which offers artists the widest and most balanced choice of pigments with the greatest possible permanence. Each colour within this wide and balanced spectrum of 96 colours, has been selected and formulated to offer the greatest choice so that artists can use a unique palette that best suits their work. You can view all of the colours in this range by going to this colour chart. The Professional Water Colour range offers a wide and balanced spectrum of 108 colours in Half Pans, Whole Pans and in 5ml tubes and 14ml tubes. A limited range of 24 colours are available in 37ml tubes. Both Professional Water Colour tube and pan colours are made individually to the highest standards. 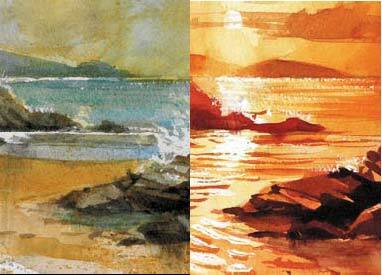 Pan colour is often used by beginners because it can be less inhibiting and easier to control the strength of colour. Tube colour is more popular overall, used by regular users, those who use high volumes of colour or stronger washes of colour. Many painters have both, as pan colours are useful when travelling and sketching. Of course, artists can use both tube and pan together if they wish. In simple terms, a water colour is produced by combining (or suspending) a pigment with a binder, for example, Gum Kordofan, a type of Gum Arabic. The formulations for our Professional Water Colours are each unique and vary according to the nature and behaviour of each individual pigment. 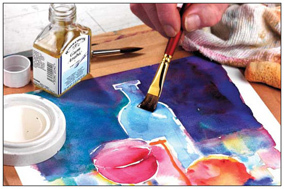 With this in mind, and with a range which has thousands of different applications by millions of artists worldwide, we rely on expert chemists who have spent their working lifetimes understanding and formulating Professional Water Colour. In fact, these chemists have learned from the chemists before them who also spent their working lives at Winsor & Newton - since William Winsor died in 1865 we have only had four chief chemists! Thanks to their experience and expert knowledge, we can continue to formulate the highest quality range with the widest choice of colours, using the largest number of pigments. Choosing the right materials for the 96 Professional Water Colours requires decades of experience and expertise from our chemists. Hundreds of raw materials are therefore chosen from worldwide sources to ensure we have the highest quality materials to make the best possible formulations. Once the right materials have been delivered to us, we also carry out comprehensive quality checks to ensure that the raw materials meet our high standards and specifications and are free of impurities. 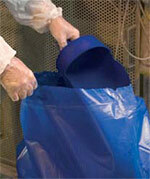 We reject as much as 25% of incoming materials when they do not meet our satisfaction! Water colour is produced by the combination of a pigment with a binder, usually Gum Arabic. Gum Arabic comes from acacia trees in Africa, principally from the region of Kordofan, which produces the best quality gum of all: Gum Kordofan. To make the best Professional Water Colours, we use the finest quality Gum Arabic for the following reasons: firstly, it is colourless and therefore does not affect or compromise the natural character or colour of the pigments. Secondly, it is less soluble and provides stable adhesion of the colour upon the painting surface to enable the artist to apply layer upon layer of jewel-like colours without muddying the colours underneath. We do not use just one solution of Gum Arabic to formulate our 96 Professional Water Colours, however. A variety of binders are manufactured to suit various pigments and each formulation contains a selection of these binders. 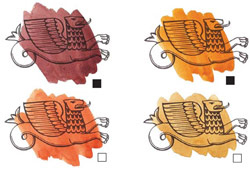 As each pigment has slightly different requirements, each Professional Water Colour therefore has its own individual formulation with greater or lesser proportions of one or more of the key binders and ingredients. Devising the right machinery and using it correctly is essential to the manufacture of ProfessionalWater Colour - the best ingredients must be prepared using the best methods. Custom made machinery controlled by experienced operators has therefore been designed to ensure that each of the 192 formulations (tubes and pan) in the range is manufactured to the highest standards. The manufacturing process is a complex one. In fact, to make the 96 ProfessionalWater Colour pans, it takes over 1400 different stages before the process is completed! In brief, there are two main processes involved - mixing the pigment and binder together and then milling to super micron fineness. Careful control of the milling process is essential as it ensures stable suspension of the pigment in the binder and helps release the full intensity of the colour. 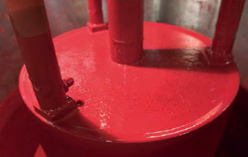 To make ProfessionalWater Colour pans, each formulation has to undergo a further process. 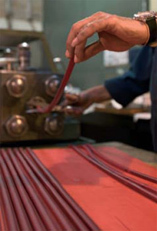 Generally, this involves a lengthy procedure of drying the colour and then extruding it into long sections. These are then cut into whole pan or half pan sizes. Only perfectly extruded pans are finally cut and glazed for artists’ use. 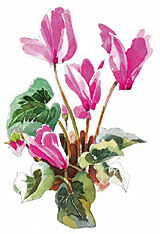 Within the traditional water colour technique, the white of the paper provides the white used as highlights in a painting as well as providing a light-reflecting background which contributes to the overall brilliance of water colours. However, many artists use Chinese White at the end of their painting for highlights or to dull some colour mixtures during painting. Introduced by Winsor & Newton in 1834, Chinese White is the most popular white in water colour. It is semi-opaque and has a blue undertone. Titanium White (Opaque White), is the whitest, most opaque white. It has a high tinting strength and a high covering power. 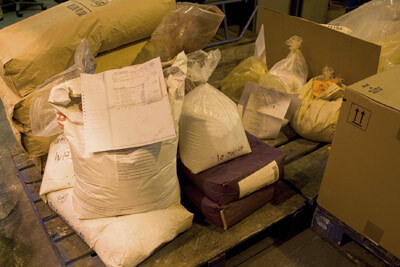 All colours in the ProfessionalWater Colour range make bright clean mixes. Artists are however, often interested in the colour theory of painting. The three primary colours in the ProfessionalWater Colour range are Winsor Lemon, Winsor Blue (Red Shade) and Permanent Rose. These colours are the best selection when only three colours are used. When using a six colour mixing system, we recommend Winsor Lemon, Winsor Yellow, French Ultramarine, Winsor Blue (Green Shade), Permanent Rose and Scarlet Lake. Water colour more than any other medium relies upon the variable characteristics of the pigments used. As it is essentially a staining technique, everything rests on the handling properties of the pigments; whether they can produce a smooth wash or a textured wash; how opaque or transparent they are; the brilliance and strength of their colour; and so on. With this in mind, it has always been - and will continue to be - our aim to provide artists with the widest possible range of pigments to give them the greatest choice and flexibility. It takes a total of 87 different pigments to produce the 96 ProfessionalWater Colours. The world’s industries have also multiplied during the history of Winsor & Newton, leading to the continual development of new pigments. Plastics, ceramics, aviation and car industries have also needed stable, bright, dense colours and this has been wonderful news for artists. Today, our ProfessionalWater Colours contain an ever-widening range of high performance pigments, which ensure strength of colour and excellent brilliance combined with extremely high permanence ratings. Just like people, each and every pigment differs in shape, size, colour, and “personality”. Pigments, especially in water colour, serve as a set of tools or vocabulary to help artists manipulate their work and alter their expression. Blue area of the spectrum showing different single pigment characteristics. Wherever possible, single pigments have been used in ProfessionalWater Colour to ensure that we offer the widest choice of colours and pigment characteristics or positions, such as hue, particle size, transparency, tinting strength, etc. This helps broaden the artist’s creative expression. We use single pigments wherever possible. 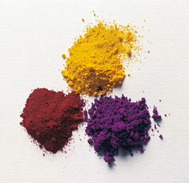 Single pigment formulations are purer in hue and cleaner in colour than mixtures of pigments, providing a larger number of colour mixes before resulting in muddy effects. Within the new ProfessionalWater Colour range there are 75 single pigments amounting to 78% of the range. Although mixed pigments inevitably lose some degree of chroma or brightness, there are many reasons why we still choose to formulate with them. In some instances, we can achieve a higher level of permanence over a single pigment alternative, e.g., Permanent Alizarin Crimson and Hookers Green. In other instances, some pigments have to be mixed to achieve a given formulation. For example, Quinacridone Gold where the pigment itself is no longer available. Inorganic: Those pigments which are derived from compounds that were never part of living matter and do not contain carbon. This group includes cadmiums, cobalt, ultramarine and a wide range of other traditional colours. Earths are also included in this group. Organic: Those pigments which are derived from living substances or substances that were once part of living things. This group includes many modern pigments known for their clarity, transparency, and their polysyllabic names, such as phthalocyanine, quinacridone, perylene and benzimidalazone. These pigments are based on carbon. Earth pigments are the oldest colouring materials in the world. The caves of Altamira and Lascaux still show artworks from at least 15,000 years ago. Natural earths are essential for their low tinting strength and natural tones, which cannot be mixed from hues using blacks and whites. Earths are coloured deposits usually taking their hue from contact with iron over millions of years. They are some of the most inert, permanent pigments available. Earth pigments are extracted from the ground and are then cleaned and washed. The ProfessionalWater Colour range includes a number of new earth colours: Brown Ochre: This is an orange-brown earth, fitting between the yellow and red earths. It closely resembles our original Brown Ochre of nearly 40 years ago. It is semi-transparent and useful in all types of painting. Yellow Ochre Light: A pale semi-opaque yellow ochre in addition to Yellow Ochre. Over the many decades of ProfessionalWater Colour, the deposits of many good natural earths have become depleted and have been replaced with synthetic iron oxides. 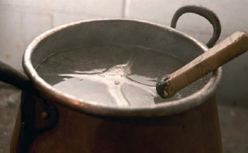 Synthetic iron oxides are appealing in themselves because they tend to be quite strong and opaque in character. The first synthetic iron oxides (“Mars” colours) date to the mid 19th century. Although synthetic iron oxides have their own great characteristics, they do not completely replace the earth pigments and we therefore recommend that the best range, as illustrated by ProfessionalWater Colour, needs to include both synthetic earths and natural earth pigments side by side. Colours based on cadmium pigments constitute an important colour range in the artist’s palette. Their unique hues, good coverage and low tinting strength are qualities unmatched by any other pigments available. Moreover, they have excellent light-fastness in combination with very high opacity. Cadmiums are the most popular reds and yellows in the palette and as artists’ colours in normal use, do not present a health hazard to the user. While there has been public concern about cadmium compounds used by other industries and their impact on the environment, it should be noted that cadmium pigments used by Winsor & Newton are practically insoluble. With this in mind, some artists who do not depend on cadmiums for their unique characteristics may therefore choose to use alternatives. There are no direct replacements for cadmiums but there are alternatives with some of the desirable characteristics of cadmiums. Below is a chart that explains how each alternative colour relates to the genuine cadmium. Quinacridones are a very important group of pigments originated in the 1950s. The first quinacridones were introduced by Winsor & Newton as Permanent Rose and Permanent Magenta. With their highly transparent and lightfast hues, these colours transformed the pink and mauve section of the palette, an area that had always suffered from poor lightfastness. Over the next 50 years many more colours have become available, ranging from deep crimson to gold. This is achieved by juggling the chemicals involved. The ProfessionalWater Colour range is split into 4 groups termed 'Series'. The series indicates the relative price of the colour and is determined mainly by the cost of the pigment. Series 1 is the least expensive colour and Series 4 the most expensive. The strength of each colour in the ProfessionalWater Colour range has been maximised by combining the most advanced colour manufacturing techniques with the most recent developments in pigment technology. Optimum colour strength offers the artists greater tinting possibilities. We choose our colours according to mass tone (colour from tube), undertone (bias of colour when in a thin film), colour strength, relative opacity and the character of the pigment in water colour, ie. granulating, staining or even wash. The resultant colour spectrum ensures the largest number of colours can be mixed from the range. Today the ProfessionalWater Colour range benefits from continued advancements in pigment technology and production methods to enable us to build upon our already high standards to produce even brighter, more transparent and more stable colours. Equally important, many of our formulations remain the same - proving that they cannot be bettered! Brilliance can be defined as the richness, intensity and depth of the colour. The optimum brilliance of every colour in the ProfessionalWater Colour range is unparalleled by any other water colour. Remarkably, this brilliance is combined with high permanence. Botanical painters will benefit particularly from the excellent and unusual combination of brilliance, purity and permanence, especially in the red area of the spectrum with colours such as Quinacridone Red, Quinacridone Magenta and Permanent Carmine. Our ProfessionalWater Colours exhibit unrivalled transparency due to the unique pigment dispersion in the manufacture of the colour. This is particularly important because transparency is the key characteristic of water colour. As a result of the thinness of the water colour film, all colours have a transparent quality on paper, allowing the reflective white of the paper to shine through. However, pigments do retain their natural characteristics to some degree. For example, transparent pigments refract light in much the same manner as stained glass, making jewel-like brilliance and clean mixing. Opaque colours such as cadmiums are likely to cover significantly more than transparent colours. The varying transparency and opacity of a pigment will affect the optical character of the individual colour as well as how the colour mixes with other colours. The most transparent colours will enable you to create a pure glazing effect by applying a number of washes on top of one another. The more opaque colours give flatter washes and greater covering over previous washes. Opaque colours are also useful for toning down colour mixtures. On the Winsor & Newton ProfessionalWater Colour chart, the transparent colours are marked with or T, the semi-transparent colours are marked or ST. The relatively semiopaque colours are marked with or SO and the opaque colours are marked with or O. The addition of Gum Arabic will also increase transparency. By adding Gum Arabic to a colour wash, you will achieve even greater transparency and luminosity from your washes. Some pigments show a characteristic called granulation, where the way in which the pigment particles settle in the paper creates a mottled effect. For many artists, granulation is highly desirable because it adds visual texture to their paintings. Even within granulating colours, different effects are apparent when they are brushed out onto paper. Some fine pigments rush together in huddles, more commonly called “flocculation”, whilst other heavy pigments fall into the hollows of the paper surface. As a general statement, the traditional pigments granulate, e.g., cobalts, earths, ultramarine, etc... The modern organic pigments do not, e.g., Winsor colours. Granulating colours are marked on hand painted and printed colour charts with a “G” beneath the colour chip. They are also detailed in the Colour Charts and the Spectrum Colour Lists. 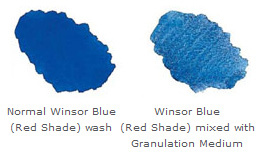 Granulation Medium gives a mottled or granular appearance to colours that usually give a smooth wash, such as Winsor Blue (Red Shade). By adding Granulation Medium to colours that already granulate, such as French Ultramarine, the effect is further enhanced. As water colour relies upon the relative absorbency of the paper surface for stability, more powerful colours such as Prussian Blue, Alizarin Crimson, and the modern organic pigments such as Winsor colours penetrate or stain more than others. These colours cannot be lifted completely with a damp sponge. The traditional inorganic colours and earths tend to lift more easily from the paper. Those colours that are more likely to stain a surface are marked "St" on the ProfessionalWater Colour colour chart and the Composition and Permanence Table. Lifting colour entails sponging water colour from a surface. It can include anything from a complete wash down under running water, to getting a "smoky" background, to the sponging out of a small area in order to lighten or rescue it. Winsor & Newton Lifting Preparation helps ensure that colours, including those that stain, can be more easily lifted from paper with a wet sponge or brush. Lifting Preparation must be applied to the paper first and allowed to dry before removal. Since 1832, one of our founding principles has been to offer a range of ProfessionalWater Colours that has the greatest possible permanence. Fortunately, the 20th century featured enormous improvements in the lightfastness of colours, helping us in our quest. In fact, over the last few decades, advancements in this area have been nothing short of remarkable. New pigments developed for the car, ceramics, and plastics industries have provided us with an astonishing array of colours with unparalleled permanence. As a result, 93 out of 96 colours in the ProfessionalWater Colour range are classed as "permanent for artists' use". This means that 97% of our ProfessionalWater Colours are rated AA or A for permanence to ensure that the colours used today will appear the same for generations to come. Sometimes certain desirable or historical colours cannot be achieved or matched unless less lightfast materials are used. In the past, this was much more common and our ethic was that we must provide choice. After all, many artists may not need the original work of art to be permanent in itself, e.g., illustrators or designers. Opera Rose is a case in point. Quinacridone Red and Quinacridone Magenta are vivid, lightfast violets which have proved to be hugely useful to botanical artists who specifically require their original work of art to be lightfast. Opera Rose, however, offers a brightness beyond any of these lightfast colours and is so desirable because it can represent the most vivid colours in the garden. Although a B rating, Opera Rose is in fact significantly more lightfast than any of the older pigments of its type. This is one new colour where the hue will be more desirable for some artists than the ultimate longevity of the colour. The quest for permanence has turned water colour from a less lightfast, delicate media into one which is equal to oil colour despite the extreme dilution of the paint film. Recently available pigments have enabled us to meet that quest. It's worth remembering that Opera Rose, even with its astonishing brilliance, is equal to or superior in permanence than many of the commonly used 19th century pigments. The definitions and ratings of permanence for the ProfessionalWater Colour range are discussed in the Composition and Permanence Table.